"design is too fiddly and fragile"
plan design of fuselage sides is too fragile and fiddly. I had to create a new fuselage that is stronger and more stable from sheet Styrofoam. Wing and tailfeathers were on par with other kits I have built. Over 40 Lazer-Cut Parts and Hand Selected Balsa. Light-Weight Gray, Green and White Tissue Paper Covering. Vacuum-Formed Plastic Cowling, Exhuast and Canopy. This is a Low-Wing, Single Cockpit plane from France. Full Size Plans, Step-By-Step Instructions, Balsa Sticks, Lazer-Cut Balsa Sheets, Vacuum-Formed Cowling, Plastic Propeller and Wheels, Wire Propeller Shaft & Landing Gear, Tissue Paper, Decals and Canopy. "A LITTLE TOO MUCH WORK"
I was looking for an easy to assemble a rubber band flying aircraft. 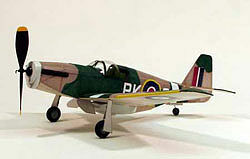 This model is time consuming and once you are finished, the aircraft may not fly correctly. Even after you have assemble the aircraft there may be some adjustments needed. The instruction is easy to follow and there is a overview diagram to help with assembling.